We provide care to more than 80,000 patients in the comfort of their own home, at their place of work or in the community. Our services range from straightforward delivery of medication, to specialist nursing for complex conditions. Because we manage the entire end-to-end homecare journey, using our own in-house team of experts and closely monitored processes, we are able to control and assure safety and quality at every stage of the clinical homecare journey. We’re part of McKesson, a leading provider of integrated healthcare services to the NHS, specialising in medicines, pharmaceutical care and primary care patient services. 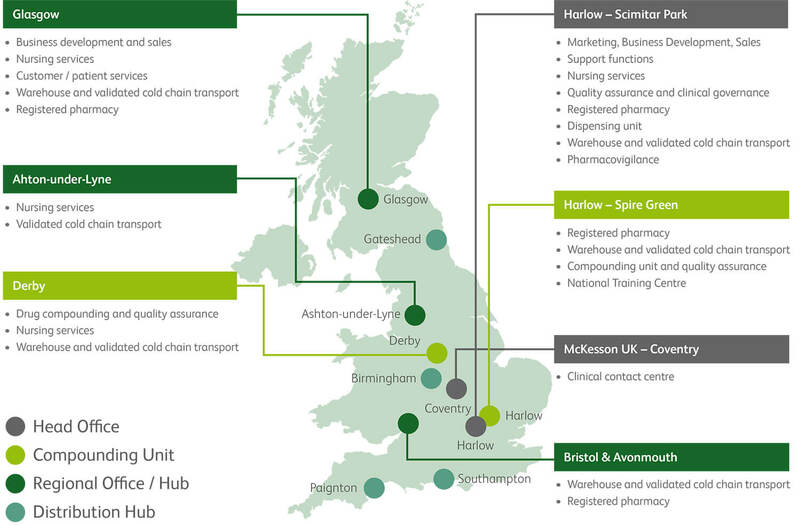 McKesson’s services stretch from medicines manufacturers all the way through to individual patients in community pharmacies, in hospitals, care homes, HM prisons – and of course, at home.